TOAST BRINGS COMFORT TO MILLIONS. It’s official! 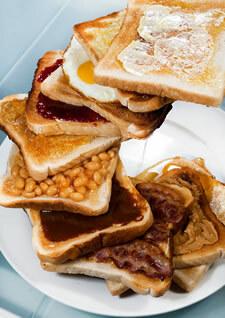 Toast has been scientifically proven to be the UK’s number one feel good food and Britain’s most loved food smell. Professor Tim Jacob, School of Biosciences at Cardiff University has found that the smell of toast triggers memories of happiness. A 2010 survey by the Flour Advisory Bureau found that we are a nation of toast lovers with over 99% of us claiming we simply love toast. With over 2 millions students heading off to university on tight budgets and armed with minimum culinary skills, toast will become a food stable for many and 42% of them going said toast would remind them of home and hence evoke feelings of comfort.